It’s written on the wall… in chalk. 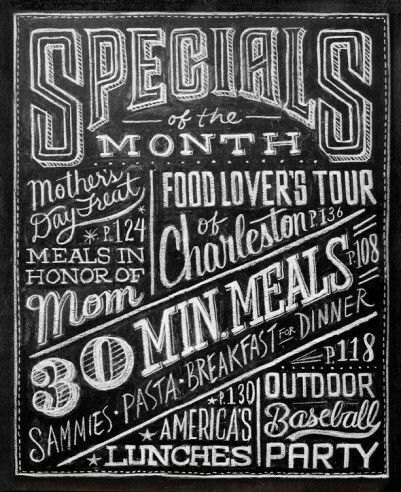 Recently chalkboard art has been everywhere. It’s no longer just for kids…. It’s a cute way to make a space customizable with constantly changing artwork. There’s also something so wonderfully personal about artwork that you create yourself for the space that you’re in, giving the same effect as a lot of photos or memorabilia. Personally, I feel like it creates that sort of casual bistro vibe of a culinary space where the wine list and menu are constantly changing. A can of paint and you are good to go for the seamless look or fun and framed if you’re looking for a more defined traditional effect. I have a chalkboard wall in my kitchen but i still haven’t used it cause I don’t want to get it dirty! Sad, huh?